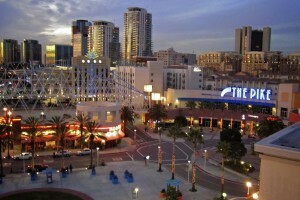 Downtown Long Beach is the heart of Long Beach, California, United States, and is the location for most of the city’s major tourist attractions and municipal services. It is also the location for numerous businesses. There are many hotels and restaurants in the area that serve locals, tourists, and convention visitors. Downtown Long Beach is bounded by the Los Angeles River to the west, and Ocean Boulevard to the south (south of Ocean is considered the “Downtown Shoreline,” a separate area). Alamitos Avenue roughly delimits downtown to the east, although the City’s actual downtown zoning extends a few blocks east of Alamitos.Similarly, downtown effectively ends around 7th Street to the north, but the City’s downtown zoning carries as far north as Anaheim Street between Pacific Avenue and Long Beach Boulevard, and up to 10th Street east of that.The greater downtown area includes the neighborhoods of the East Village Arts District, the West End, North Pine, the Civic Center, and the “Downtown Core” or central business and entertainment area.